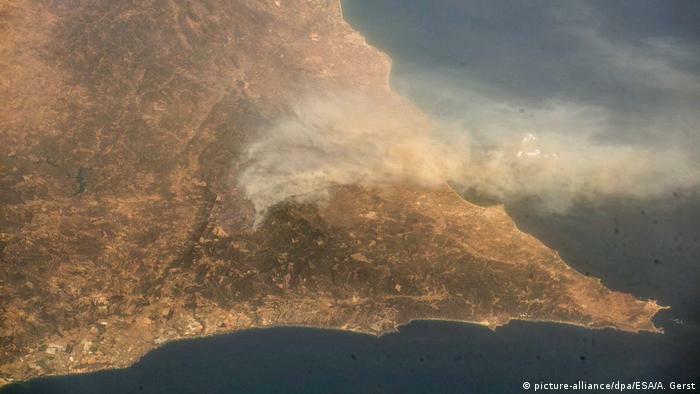 The devastating forest fires in the Algarve in southern Portugal has lost on the seventh day a significantly in intensity. The fire has so far destroyed more than 23,000 hectares of forest. 36 people were injured. The fight is not over yet, a resurgence of the flames could not yet be ruled out, said a spokeswoman for the Portuguese civil protection on Thursday. About 1,400 firefighters, soldiers and Volunteers are still in use, in order to keep the flames under control. The fire in the mountainous area to the small town of Monchqiue has so far destroyed more than 23,000 hectares of pine and eucalyptus forests. Hundreds of people had to be evacuated, including many tourists. According to the civil protection so far, 36 people were injured, one of them seriously. In the Monchique approximately 6000 inhabitants. The small town is located about 40 minutes by car from the sea, where the two Algarve tourist resorts of Portimão and Lagos with beautiful beaches. The mountain region of Monchique is one of those areas in Portugal, be at particular risk of forest fire. Eucalyptus mono-cultures, the Lack of firebreaks and hard-to-reach valleys of the beneficiary in the year 2003, a devastating fire disaster in front of the gates of Monchique. At the time, burned 32 000 hectares of forest. The cause of the fire is, meanwhile, more unknown, arson is not excluded. The office of the public Prosecutor and the judicial police opened investigations. Next articleWat Is een PDF-Bestand (en Hoe)?